1. Lay pieces pork liempo cuts in a container. Add chopped garlic, peppercorns, and laurel leaves. 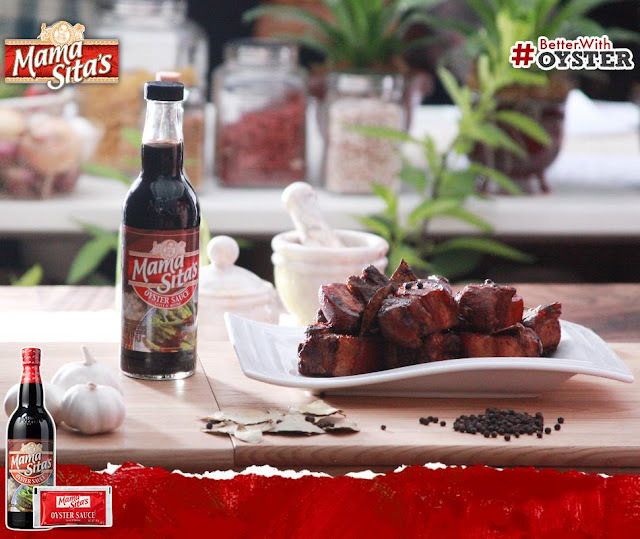 To achieve the Zsadobo taste, add Mama Sita's Distilled Cane Vinegar, Mama Sita's Soy Sauce, and Mama Sita's Oyster Sauce. 2. Mix all the ingredients until the pork liempo is evenly coated. For better flavor, store in fridge and marinate overnight. 3. After the marinade has set in the meat, cook the Pork Adobo in medium heat and bring it to a boil. To achieve tender meat pieces, boil for at least an hour - the longer it boils, the more tender the pork will be. 4. For added crispiness, set aside the sauce and fry the pieces pork adobo in olive oil until the sides turn brown. 5. To serve, top the fried pork adobo pieces with the sauce.